Whoa! This is Part 2. You might want to start at Part 1. Or maybe even here. Practically every film Alfred Hitchcock made was in the service of “pure cinema.” Why, then, did he occasionally eschew the established cinematic grammar of editing and montage in favor of long takes? Were these “experiments” deviations from his mission to create “pure cinema,” or were they artistic decisions made in its service? I believe the latter is the case. Here's why. Hitchcock caught the film bug at around the same age I was when I caught the Hitchcock bug—he was just a teenager. It was 1913 and he, like everyone else of that time, had never seen anything like it. To that generation, it wasn't “only a movie.” It was a motion picture, the result of a series of scientific advancements that projected an uncannily convincing illusion of movement on a bare white wall. In those days, there was no such science as film editing, which meant there was no montage and no close up. In fact, the camera rarely moved at all. It just sat there, unblinking, devouring the action that took place before its lens. Those early cameras were as passive as the audiences they served. You could say that it was an age of innocence for the camera, the era before that machine became aware of its power and freedom; that it could turn its attention elsewhere via editing; that it could select its viewpoint by moving in for a close-up. Eventually the camera realized that with montage it could treat actors like cattle, knocking veteran stage performers down a rung or two, even making them seem to portray emotions they never intended, turning the meekest of them into coldblooded killers. Perhaps even more miraculously, the camera could make an audience think just about anything its handlers chose. Still, before all those techniques were discovered, the essential magic of the movies was born fully formed when Georges Méliès (1861 - 1938) first began amazing audiences with magic shows whose tricks were impossible in real life but which were all in the day's work of an inventive film maker. Before Pee Wee's playhouse and The Wizard of Oz, there was Méliès' The Man with the Rubber Head (1902). The reason I bring this history up is that this is the world of movies to which Hitch was introduced during the formative years of his youth. I believe he tried to create that sense of wonder, using, among other things, surreal imagery, a sense of the uncanny and, as I hope to demonstrate here, "pure film." Viewed in retrospect, Georges Méliès' A Trip to the Moon is really nothing more than actors clowning in front of a camera, with some ingenious special effects thrown in. But that's the point. The joie de vivre of pre-montage silent cinema is as frothy and simple as whipped cream. Soon enough, along came the 1920s and the theories of montage developed by Russian film directors, such as Sergei Eisenstein, Vsevolod Pudovkin and his fellow countryman Lev Kuleshov, whose famous experiments pretty much formed the basis for his editing scheme for Rear Window. Hitchcock schools Fletcher Markle on the Kuleshov effect. But Hitch was nothing, if not an innovator. He knew that the Russian cookbook was only one of any number of ways to shoot a movie. With its series of long takes spliced together to appear to be essentially one long take, Rope was his greatest effort to create “pure film” using other means. I believe his approach was also an attempt to return to the wonder years of early silent cinema when all movies were shot in a single take. In 1934, Hitch said in an interview, "I think cutting has definite limitations. Its best use is in violent subjects. That is why the Russians made such effective use of it, because they were dealing with violence, and they could pile shock on shock by means of editing." The long takes of Rope (1948) and Under Capricorn (1949), as well as his other films to a lesser extent, comprise a qualitatively different and new way of 'writing with the camera.' They are a breed apart from the long takes of other directors, such as those of Orson Welles, who employed the technique for theatrical, not purely cinematic purposes. Those two movies are remarkable artistic and technical achievements, but thanks to their critical and financial failure, they resulted in the dissolution of Hitchcock's production company, Transatlantic Pictures. After an up-and-down stretch (critically and financially, but not creatively) in the early fifties, in 1954 Hitch ran for cover to direct Dial M for Murder -- a surefire hit in 3-D. That bumpy ride proved to be prelude to an extraordinary string of a triumphs never matched by another director, beginning with Rear Window (1954) and ending with Psycho (1960). And then came the early 1960s: The Birds (1963) and Marnie (1964) were as self-consciously "arty" as Rope and Under Capricorn, and they also flopped -- though, not as spectacularly. Much has been written about Hitch's supposed directorial hubris on these films and that the failure of Marnie, in particular, was a Waterloo-like defeat for him. The current thinking is that high praise from the critics at Cahiers du Cinema, along with François Truffaut's almost sycophantic bond to Hitchcock, went to the director's head. (This, despite having endured decades of cycles of praise and dismissal.) He has been criticized for losing his perspective, believing the he didn't need stars in his films, because the Hitchcock name alone was enough to draw audiences into the theater. Let's address that. While he obviously relished the attention from the French critics, I doubt that he allowed it to inflate his already secure ego to the degree that it greatly affected his artistic choices: there's no doubt that he was always humble before his muse. Further, after decades of unrelenting self-publicity, along with the success of recent films and his TV show, he had, indeed, become a star in his own right. He had worked for years to get to a point where he no longer needed expensive, spotlight-grabbing A-list stars in his films. With Psycho, he proved that he didn't need his legendary team of brilliant technicians and that a TV production crew could do just fine. That's not an ego trip: it's what he had been working toward for decades. Putting the full weight of his creative energy into those movies, he'd hoped that they would be regarded as his greatest achievements. So you can imagine how crushing it was for him to see them fail. It was Transatlantic Pictures all over again. Still Hitchcock was a survivor. The more "conventional" films of his that followed -- Torn Curtain (1966) and Topaz (1969) -- have been devalued, alternatively as the work of a chastened creative genius; a lion in winter shackled by his fiscal obligations to Universal Studios, in which he held a substantial equity position. Most damningly, biographer Donald Spoto wrote that they were the work of a man who had “lost all interest in his women, his actors, his stories – indeed, in movies.” Um, yeah.... With all due respect to these astute writers, I have to politely disagree. True, Hitch's age and the loss of some of his longtime collaborators in the mid-sixties were real setbacks. Studio bosses cramped his style and killed a pet project or two, but none of that was new to him. That's Hollywood. With Torn Curtain and Topaz he was simply repeating the pattern of the fifties (and, early, the thirties, which I haven't yet mentioned): after a pair of failures, he returned to a tried-and-true formula, the spy thriller. Those two movies have so much to offer that I fear they are unfairly overlooked -- particularly as gems of "pure film." To be honest, Torn Curtain suffers from wooden performances by Julie Andrews and Paul Newman -- she looks like she'd rather be dodging Nazis with the Von Trapps and he looks like he forgot to bring a roll of Tums antacid to the set. Some of the expository dialogue makes me wonder if Hitch even showed up to work on those days. The music is awful and Bernard Herrmann's unused score could well have saved the film. But, even for those flaws, the film still carries more heft than most anything else you might find coming out of Hollywood. For starters, fellow Hitchcock geek Ken Mogg interprets the "fire and ice" imagery of the opening credits, in which a red flame is set against apparition-like images of some of the characters to represent, respectively, Schopenhauerian Will and Representation. Who knows whether or not Hitch was literally thinking of the German philosopher (though the film's title could refer to the veil that separates Will from Representation), Ken's observation is spot on! Torn Curtain still offers up profound moments of "pure film." The famed murder of Gromek is Hitch's most harrowing death scene up until that time, and I never tire of watching it. But check out the perversely beautiful chase scene below. It might be the oddest chase you'll ever see on film. It's also one of the most compelling. Set in the exquisite Greco-Roman beauty of the East Berlin Museum, the scene reprises Scottie's visits to the Palace of the Legion of Honor in Vertigo -- but this time on a hit of crack. The narrative is underscored, not by lush orchestration, but by the minimalist tap-tapping of two pairs of shoes. You wish Paul Newman could stop and enjoy those masterpieces on its walls, but he is as unstoppable as the movie itself. Boom. "Pure film." But getting back to the long take. Midcentury audiences weren't as gullible as those in Méliès' day. They knew that editing can conceal as well as reveal. Montage can deceive. Thus, although Hitch found (the hard way?) that long takes can't be employed exclusively, he recognized that they served his quest for “pure film” very well and he never fully abandoned the practice. The uninterrupted gaze of the long take confers a sense of unfiddled-with truth. That's why Hitch encouraged its use in the production of documentaries that depicted the horrors of the Nazi concentration camps, knowing that audiences might not otherwise believe their very eyes. Skipping Topaz for now (with regrets -- it's one of my favorite Hitchcock movies), Frenzy (1972) was a return to form for Hitch -- his last masterpiece. But time was running out for the old man. Following Family Plot (1976), he died with his boots on, devising new situations and plot twists to the last. I believe that if he'd lived another 10 years, he would have recovered from the missteps of the 1960s. That was his creative cycle. i When Bergman, who disliked performing long takes, saw the finished product she recognized that it added power to her show-stopping performance. Although I generally agree with much of what has been said here I have to come to the defense of Orson Welles and your comment that Orson Welles used the "long take" shot not for," purely cinematic purposes." The famous long take that opens Welles' TOUCH OF EVIL cannot be described as merely a theatrical effect. In fact, the opening long take of TOUCH OF EVIL (in both its restored and theatrical release versions) is a prime example of pure cinema. The camera weaves its way through a set to capture the point of time marked by an assassin's timebomb. Not to mention the other two "long takes" in the lovebirds apartment within the same film. If montage and editing organizes filmed elements in such a way as to emphasis details that would not have otherwise been noticed then pure cinema is just another means of hiding what has been organized. The notion of pure cinema- that is the organization of characters, mise-en-scene and camera moves in one contigious shot is an attempt to capture the uninterrupted "rhythm" of life- the timing of things within one uninterrupted shot. A comparision of this notion of time and pure cinema could be made between the Russian filmmaker Andrei Tarkovsky who also shot in long takes, Michelangelo Antonioni who also used long takes and Hitchcock. Much more needs to be discussed on this fascinating subject. As usual an interesting post. I think it terms of pure cinema you might have added The Birds since in terms of pure cinema it represents IMO the Eye of God, the visual sense so important to Hitch making his golden period run from Rear Window through The Birds. Also, in terms of pure direction I would point to Vertigo where Stewart like a director who remakes his actors (the famous cattle quote of Hitchcock) entirely remakes Novak into his fantasy figure. Elster also does this earlier in the film. North by Northwest is an almost pure McGuffin adventure whose tracks on the 20th Century Ltd. were laid in Strangers on a Train his minor masterpiece just prior to the Golden period.Where he shows how motivations and plot lines can be changed at some switching station under the director's control. Also, the relationship of Marnie to Psycho, where as I believe you pointed out on this blog half of the shock value comes from the score which registers emotion, Marnie with its splotch of red which elicits her hysteria (due to her murder of her prostitute mother's client) similarly represents human emotion boiled down to its elementary blood red representation (and Hitch's favorite vehicle, murder). I liked your tracing Hitchcock's inspiration to Meliere and the Through the Glass Darkly reference that conjures up images of Ingmar Bergman with his film Through a Glass Darkly and Alice's Through the Looking Glass. The former reflecting the biblical idea of viewing reality from both sides of the mirror of life and death. Bergman an agnostic minister's son caught up like Hitchcock the (questioning) Catholic concerned with the existence of a life after death--the other side of the Darkened Glass. Hitch's last film Family Plot with its connection to a medium questions whether in representing a pure art of film we can capture a glimpse of the other side or whether like the motivations of The Birds, God's purpose in the world, if he exists, must remain a mystery. 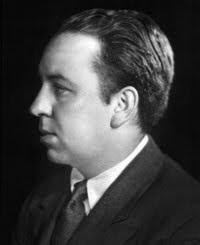 Although Hitch provides the clues, like a murder mystery, in all his attempts at pure film art, particularly in his golden period with the tracks of exploring it and the essence of summarizing it in the pictures just prior to and subsequent to his golden period, Strangers on a Train and Marniem IMO. For me, the difference is this: when I watch Welles, I feel like an astounded observer. When I watch Hitch, I feel like I'm present with the actors, interacting with them and with the director. Of course, the long take was only one tool in Hitch's "pure film" bag of tricks. He spoke of PSYCHO (in general, but the shower scene in particular) as being a demonstration of pure film. In that case, montage created an experience inside the viewer's head that is only approximately analogous to the actual succession of images. This is a fascinating discussion. There are, it seems, as many interpretations of Hitchcock's conception of pure film as there are Hitchcock scholars. Thanks so much! Interesting connections. I'd FAMILY PLOT has so much more to offer than first glance reveals, eh? Joel--the second best piece of writing, lol. Well contend though that Welles and Hitchcock were both cinematic purists, just coming at it from different visual and visual-structural strengths. It's fait accompli that Hitchcock was the artist who had a more pop sensibility about audience limits.